My old (not age wise…?) racing friend Steve Allen of http://www.bevelheaven.com owned an Eldorado…or maybe it was an Ambassador, either one it doesn’t matter, he loved it. My friends Eric and Ken (both are Bonneville Land Speed record holders) run a Guzzi streamliner at Bonneville and I have always lusted after one. I have ridden Eldorado’s , 850 and 1000 Le Mans and even a fairly newer California model. Loved ’em all. And so did the LAPD and the California Highway Patrol. There is just something about a simple tractor motor put into a motorcycle fame that’s just w wonderful. The Eldorado has a whopping 64 horsepower, a long chassis, a boat-load of torque and looks a lot heavier than it really is. Is it easy to ride? Oh yeah. Would you race your buddy through your local canyon road? No. Would you take your wife or girlfriend (not both at the same time…) from Santa Monica to Nova Scotia…absolutely. The Eldorado was designed for long distance. Smooth easy loping motor, very predictable handling, great ergonomics…what more could you ask for? Smoother shifting and better brakes. I found a really great one on ebay this morning that is truly a fly and buy bike. It has been upgraded with a 1000cc engine kit, well maintained and the stock handlebars. This is a good deal. Besides riding around South Carolina this time of year sounds like a lot of fun. Years back a friend decided he wanted to live “Off The Grid”, I think that at sometime in life quite a few of us have thought of that. Then reality hits. A wife, kids, going to PTA meetings, and how far away is the nearest grocery store? Dan decided to wait until PTA meetings were over and kids were off to college before he headed down the path of “Off The Grid”. Dan had spent years planning this transition in life (much to his wife’s dismay and consternation) and then the day came…”Honey, I found us a piece of land in Arizona that would be perfect for getting out of the Rat Race. Now I’ve known Dan for years and over those years he acquired quite a motorcycle collection, some were pieces of junk (we all have those) and some were very special. He sold ’em all to buy this piece of land and an Airstream trailer to plant on it. Again, his wife just sat there shaking her head and wondering what kind of medications could help her husband. Fast forward about a year…This “living off the grid” ain’t all it’s cracked up to be and more importantly Dan missed his motorcycles. Sell the land, the Airstream, move back to town and buy a motorcycle. This time he decided on a classic bike instead of something modern. How ‘Vintage’ is vintage, how ‘Antique’ is antique? Dan opted for Pre-war American. Indian, Harley, Excelsior??? Dan found a beautiful Harley WL model Flathead that needed some love. A few months later, and about as much money as he paid for his Airstream he had a big smile on his face and his overly tolerant wife was happy to have central air conditioning. The ‘Flathead’ design motor was very common throughout motoring history. Dating back to the early 20th century it was used in cars, tractors, pretty much anything motorized. The design was simple, dependable and relatively cheap to manufacture. However, it’s design did limit its power output, there are always trade offs. The WL Model Harley Davidson was a 45 cubic inch model that eventually found itself doing service in World War Two for not only the US troops but also for the Russian Army, they bought nearly 30,000 of them. After the war, the WLA model (A was for Army’) was very popular with returning GI’s. There is a lot more history available out there about the Flathead Harley’s and it’s quite fascinating. When it comes to Flatheads though there is nothing like the sound of a Ford Flathead to wake up you soul! I found a really beautiful 1941 Harley WL model on Ebay this morning. Earlier in this story I talked about my friend Dan and his Airstream. He paid nearly $30,000 for that trailer, he sold it for about the same. After he finished all the work he had done on the 1940 Harley, he could have bought back his trailer and given his wife a dish washer and air conditioning. It didn’t matter, he loved the bike. The bike I found on ebay this morning is a deal! It is ready to ride. It does show it’s age and that is just great. If you’re not the adventurous type or a skilled mechanic you may not want to ride the bike across the country, but for weekend outings, it’s perfect and well worth the money. Click on the pics below for more info and pictures. There’s an old saying out there “God rides a Harley”…there is another one that goes along with it, “If God rides a Harley, God rides slow”. On this bike, slow is just fine. This entry was posted in antique motorcycles, ebay, rare motorcycles and tagged choppers, harley davidson, touring motorcycles, vintage american motorcycles, vintage harley davidson, vintage motorcycles on November 17, 2015 by themotoworld. Sometimes I just can’t help myself. I love Cafe Racers. Simple. A purpose built/modified machine that can get from here to there quite fast in high style. A cafe racer is a function before fashion machine but…the fashion is definitely there too. A good friend of mine has recently discovered Cafe Racers. He started his life on a Harley Davidson Sportster, all blacked out, then moved on to a Street Bob (a big twin Harley), again all blacked out and loves it. He is a part time member of the “Harley Culture” but he is expanding his views. My subtle hints and sending pictures of cool bikes seem to be working! I was living in Las Cruces New Mexico when the original Gold Wing was introduced. The GL1000 was at first thought of as a big bore Sportbike, but as we all know, it became the Supreme Leader in touring bikes. Why the change in thought? 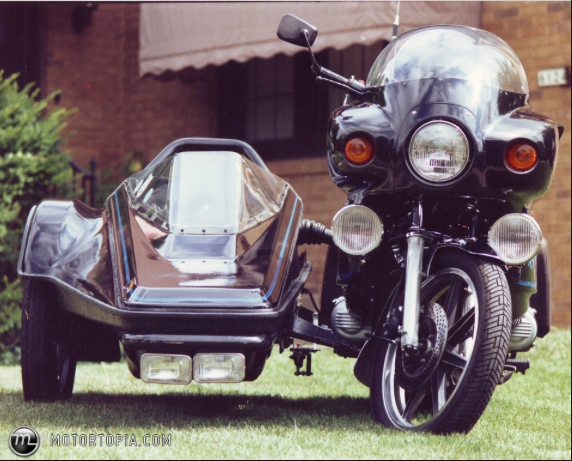 The original was a touring bike to go up against the Harley Davidson Electra Glide, but the molds for all the touring accessories were accidentally destroyed so the bike was brought out naked and American Honda tried to market it as a Sportbike. Well, the aftermarket (in particular Craig Vetter) had a field day with accessories. In no time at all you could make a Gold Wing as comfortable as a Winnebago. It is the motorcycle that changed touring motorcycles forever. I rode it back in 1975 and thought it was rather Ho-Hum (I was riding a Kawasaki H2 750 at the time). Fast forward a few decades when I bought my father his Gold Wing, I came to realize just how good this motorcycle is. I started looking at Gold Wings as more than just an ‘old man motorcycle’ but as a platform for some serious fun. Granted, you can’t convert a modern Gold Wing to anything other than what it is but get an old GL1000 or 1100 and the fun begins. I found a very nicely done Cafe Racer ‘Wing’ on ebay this morning and it looks very appealing. A little too blingy for my taste but very well done. Pretty low miles for a bike it’s age…my wife says the same thing about me. NOT. Some really nice upgrades and like I said, a little on the ‘Blingy” side for me but nicely done. Click on the pics below for more pictures and info. This is a very cool bike. This entry was posted in custom motorcycles, ebay, vintage cafe racers and tagged harley davidson, honda, honda gold wing, Honda motorcycles, kawasaki H2, touring motorcycles, vintage cafe racers, vintage japanese motorcycles, vintage motorcycles on May 12, 2015 by themotoworld. My motorcycling life started with riding my dad’s Honda CB160 into the back end of his new Chevy Impala…I hate when that happens. After that he decided it was probably safer to head back to Vietnam than teach me how to ride a motorcycle. He was a helicopter jockey in the Marine Corps. Fast forward a couple of decades and Dad decides he wants to ride a motorcycle again. No matter how hard I tried to talk him out of it he wanted to ride. So, I found a Honda CB350 in somebody’s back yard for a hundred bucks that needed some love and gave it to Dad for his birthday. And from there everything went downhill….he loved riding. After about a year and 5000 miles later he wanted something bigger so he could travel with me. I found a really nice Honda GL500 Silver Wing and again another birthday present. He and I did the Three Flags Classic (Mexico to Canada in 3 1/2 days) three or four times and he put about 50,000 miles on that Silver Wing. I rode it as well ( a tour of the Four Corner States) and absolutely loved it. Had to replace the rear air shock in Gallup New Mexico, deal with electrical issues in Glennwood Springs Colorado…but other than that, change the oil, put gas in it and go. Anywhere. The GL500/CX500 is a really great motorcycle. I have written before that it takes the MotoGuzzi V-twin twists it around a bit to make it work Honda style, and then Honda put a Turbo charger on it, pumped it up to 650cc and then twisted it a bit and again made it bigger for flat track racing. It really is an incredible motorcycle. And in my opinion, an excellent platform for a Cafe Racer! Does that surprise anyone who knows me? No. The Silver Wing Interstate is a wonderful middleweight tourer. The luggage is easy to use and big enough for one person to travel across the country with no problem. The one I found on ebay today is in good shape, is aging nicely and has pretty low miles. The asking price is a little up there but not unreasonable. This is fly there fill the luggage and ride home. This entry was posted in ebay, vintage cafe racers and tagged Honda motorcycles, touring motorcycles, vintage japanese motorcycles, vintage motorcycles on May 9, 2015 by themotoworld.